Does the colour of your favourite shoes looks dull or just out of fashion? No worries. Waproo Colour Change products have a wide range of colours that you can choose from to help you in your recolouring needs. Over 20 shades are available to choose from to become fashionable or just suit your day to day need. The colours are intermixable to help you get that particular colour or shade, which you look for your leather colouring. Prepare your painting area by covering the area with a tarp or old newspapers to avoid paint stains. Stuff the shoe with paper or a shoe tree before getting started with the recolouring process. This will allow the wrinkles and other crevices to open and make a level surface to clean. And as with all application on leather and other materials, preparation of the item to be dyed is to be carried out before colourant or dye can be applied. Apply the Waproo Stripper on your leather shoe using a rag or cloth. 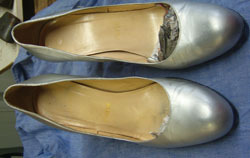 Liberal application of Stripper and a vigorous rubbing with the rag or cloth will remove the previous color, shine, dirt and any oil stains existing on the shoe. 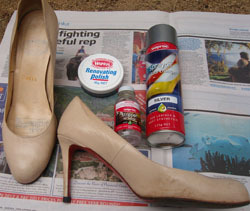 Alternatively, apply Waproo Preparer to the synthetic shoes in the same method as described for leather. Use the stripper on the leather and preparer on synthetic objects in order to get rid of dirt, oil and polish. 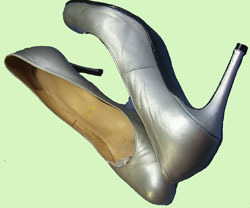 Apply some amount of the stripper or preparer to your shoes rubbing evenly on the entire surface. Apply Masking Tape where ever required. You can use this in the joints or the specific areas where you do not want to recolour e.g. sole etc. 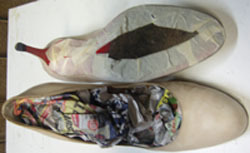 Masking tape protects the area of your shoes that you do not want to get painted . Shake your Sprayon Colour Change very well (about 5 minutes) until its colour content is well distributed before applying it. 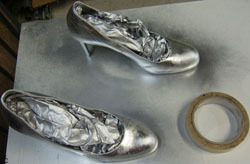 Use Waproo Sprayon Colour change and apply on the surface of the shoe holding the can about 20cm away from the shoe. Apply with long strokes, take care to apply a thin layer (tack coat) even if it might show up some patched strokes. You can cover it up in the subsequent coats. Allow the colour to dry thoroughly for about 1 hour then apply the next coat. Apply the Sprayon Colour Change for the second time in long strokes as you did for the first coat. Leave this to dry very well until the following morning. The second coat will be sufficient in most of the cases. A third coat may be applied if you feel necessary. Finish the process by polishing the shoes gently with Waproo Renovating Polish of the same colour to see the shine.